Can two "fed-up" moms get better food into schools across America? In the face of a national child health crisis, the documentary Two Angry Moms addresses an issue of great concern to parents across the country. What are our children eating in school, who is determining that and how is it impacting their health? While angry mom Dr. Susan Rubin speaks out in Washington and organizes parents in her school district, filmmaker Amy Kalafa crosses the country in search of solutions to the many obstacles in their path. Join us for a screening of Two Angry Moms on Saturday, February 25th at 10AM at Trinidad State Junior College in Alamosa. Parking is located on the north side of the building and the auditorium is located just off the atrium. Look for signs advertising the event. Childcare will be available in the atrium for any parents wishing to view the film. Sponsored by the Alamosa Community Gardens, the SLV Local Foods Coalition and LiveWell Alamosa. For more information, contact Jan Oen at 587-5529. We recieved this information from the SLV Tourism Association. If you have questions about the conference call them at the number below! The San Luis Valley Tourism Association is hosting the eleventh annual San Luis Valley Tourism Conference on February 24, 2012. The conference will be held at the new Sangre de Cristo school building between Mosca and Hooper. Activities begin at 1 p.m. and conclude with an auction after dinner. Meet the new superintendent of Great Sand Dunes National Park as well as other Valley tourism related entities and businesses who have news to share. This year's theme will be "Valley Flavors: Promoting cultural heritage and local foods through culinary tourism." John Salazar, Colorado Commissioner of Agriculture, will be the dinner speaker. The SLV Tourism Association is accepting nominations for outstanding tourism promoter of the year! Restaurants are encouraged to have a booth using local foods and attendees will vote on the "Best Local Dish". Call 719-580-7841 for reservations and information. Ride local, eat local. The distinct flavor of the San Luis Valley is the showcase of this train as a local chef prepares locally inspired dishes from area farmers and ranchers. Food always tastes better when there’s less distance between the farm and your plate – and it doesn’t get any closer than the Rio Grande Scenic Railroad’s backyard. Ride one of the few operating winter trains in Colorado AND support the effort to promote local foods in the SLV at the same time! Departing from Alamosa, the winter train ride will take a short stop in the quaint mountain town of La Veta. 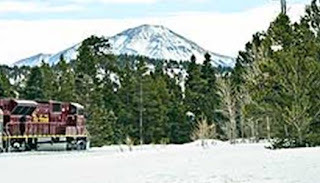 See spectacular winter wonderlands from the warmth and comfort of a train car, enjoy great food and learn about the work of the SLV Local Foods Coalition! For ticket information go to www.riograndescenicrailroad.com or call 877-726-RAIL. In order for the SLV Local Foods Coalition to receive credit for a ticket sale, please give the promotion code “SLV FOOD” to the ticket agent. In addition, please let us know that you have reserved a ticket by emailing us at slvlocalfoods@gmail.com. This free workshop will teach you how to start your own microgreens and sprouts to use in salads, sandwiches and smoothies! Seeds and soil will be provided. Donations are kindly accepted. This event is co-sponsored by the SLV Local Foods Coalition, the Alamosa Community Greenhouse and the Alamosa Community Gardens. For more information call 588-1904 or email slvlocalfoods@gmail.com.